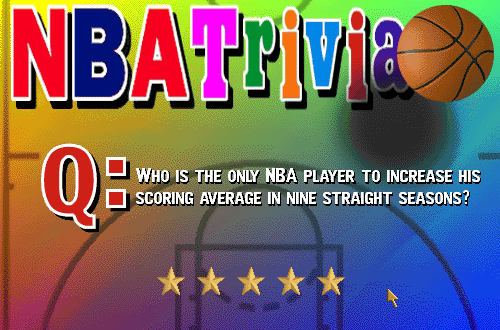 In the early days of NBA Live, trivia was basically just flavour content intended to enhance the presentation. At the halftime break, gamers were presented with a random trivia question about contemporary NBA players, or league history. The answer was then displayed during the break between the third and fourth quarters. There wasn’t any way for the game to register an answer; no multiple choice answers that could be selected by the press of a button. It was simply a fun thing to test your knowledge while you played, and perhaps even teach you a couple of interesting facts. After all, if you were playing the game, chances are you were probably a big NBA fan as well. This approach was also similar to what you might see during a local broadcast of an NBA game, with a question posed to the viewers and the answer revealed a little later on. In those older basketball games, little details like that went a long way in creating a TV-style atmosphere. On top of quizzing gamers during gameplay, NBA Live also offered up trivia facts through the Team Info pages on the roster screen, as well as the Cool Facts for players that I discussed in a previous feature. It wasn’t a comprehensive NBA history lesson, but it appealed to new and seasoned hoops fans alike, offering up noteworthy tidbits about the real NBA as we played on the virtual hardwood. Of course, it didn’t mention players who weren’t licensed to appear, such as Michael Jordan and Charles Barkley. I remember anticipating every new trivia question when I first played NBA Live 96 on PC, wondering if EA had slipped any mention of those two missing players in with the other nuggets of info. I also remember wishing that I could actually answer questions, a feature that other titles would introduce. Midway’s NBA Hangtime featured an interactive approach with its trivia: in the arcade version, it was involved with a giveaway, while the home version used it to unlock additional attributes for your created player. As the years went by, other NBA games would feature trivia in some form or another, though ideas such as Cool Facts and other reference screens fell out of vogue. Since content updates were not really feasible at that time, and many comprehensive online resources were springing up, there was less appeal to including those kinds of facts in basketball games. Simply put, there were better ways of getting that information. The idea of having gamers answer trivia questions was retained however, usually as a mini-game on the loading screens. NBA Live 08 and NBA 2K9 are two examples of games that utilised this concept to fill time while the game loaded. Trivia has made a return to basketball gaming in recent years. With the introduction of The Neighborhood in NBA 2K18, it’s become a method of earning additional VC. 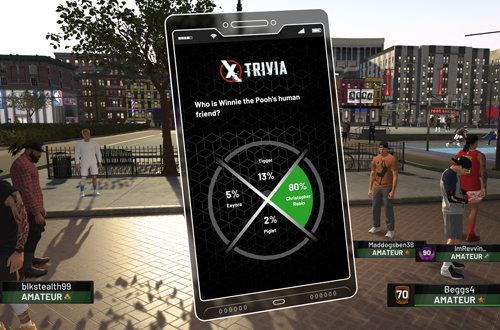 In NBA 2K18, we had to travel to the 2K Zone, pull out our in-game phone, and use the trivia app to start answering questions. There were 50 questions that were updated weekly, with each correct answer earning 25 VC for a total of 1250 VC per week. It helped with the grind – at least a little – and much like the trivia in older games, served as a means of teaching basketball gamers some NBA facts and figures (or testing the knowledge of people who fancied themselves history buffs). NBA 2K19 has brought back trivia as a daily event in its Neighborhood, with the same VC rewards for every correct answer, and a share in a big VC jackpot at stake for those who can correctly answer every question. Quite unusually for a basketball game, not every question is related to the NBA or even the sport in general. There are also general knowledge questions, with topics ranging from music and pop culture to science and even other video games. While this makes it a more challenging event – arguably a necessity with big VC prizes on the line – I do feel they should be focused on the NBA, perhaps branching out into the history of NBA 2K for a change of pace. Making trivia an interactive experience with a more tangible use is definitely for the best, and a great idea for a mini-game in modern titles. However, I do have a nostalgic fondness for the trivia in older basketball games. I enjoyed expanding my knowledge of NBA history, and the broadcast feel that it added to the presentation. It was a fun way of unlocking extra attribute points in NBA Hangtime, and more enjoyable than watching a progress bar on various loading screens. And of course, as a much younger fan, I enjoyed poring through the team information screens and Cool Facts to discover all that they had to teach me about a sport that I’d fallen in love with. 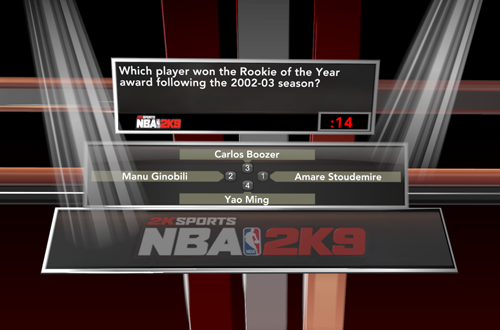 I would definitely like to see NBA 2K19’s trivia focus more on the NBA itself. The league has such a rich history filled with interesting facts and figures, so I believe that asking a few more obscure NBA-related questions would be preferable to some of the topics they’ve covered so far. With certain NBA analysts downplaying the brilliance of past eras in order to celebrate the stars of today, I also feel that younger fans should be taught more about the all-time greats and significant moments in NBA history; just as my generation was through NBA Home Entertainment releases, and of course, the trivia questions we encountered in basketball video games. As for the likes of team histories and Cool Facts, the records and retired numbers that can be found in the league history sections of MyLEAGUE/MyGM and MyCAREER should suffice. There are simply too many comprehensive resources online to make a video game your first port of call for that information. All in all, trivia may not be the most important aspect of basketball video games on par with advancements in the AI, deep modes, and more realistic graphics, but it’s long been part of the flavour content. Whether it’s been enhancing the presentation or providing a fun mini-game – with or without tangible rewards – its presence has been far from trivial.